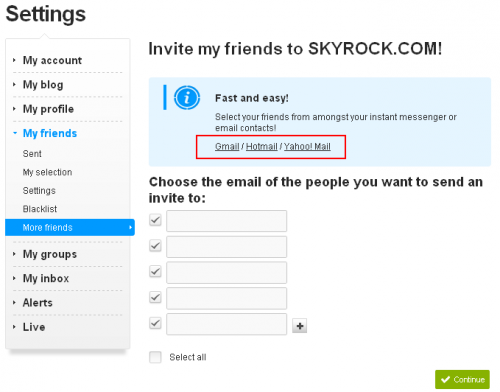 Tips&Tricks: Inviting your friends to Skyrock - Hello You! Fancy getting your friends to join you on Skyrock? Using your Gmail, Hotmail or Yahoo! Mail it couldn't be easier. All you need to do is head to 'My Friends' > 'Settings' More friends and you can instantly upload your friend list. Don't worry though, if you don't have Gmail, Hotmail or Yahoo! Mail you can still invite your pals by manually entering their email address. Fancy getting your friends to join you on Skyrock? Using your Gmail, Hotmail or Yahoo! Mail it couldn't be easier. All you need to do is head to ' My Friends ' > 'Settings' More friends and you can instantly upload your friend list. Don't worry though, if you don't have Gmail, Hotmail or Yahoo! Mail you can still invite your pals by manually entering their email address. Handy hey!